General Appearance: Low to the ground, long in body and short of leg, well balanced, bold and confident with intelligent, alert expression. They come in a variety of coats: smooth, wirehaired, or longhaired. Size, Proportion, and Substance: Miniature-11 lbs. and under at 12 months of age and older. Standard-approximately 16 to 32 lbs. Background: The Dachshund may be the breed to boast the most variety. Sizes include miniature and standard. Coats may be long, short or wirery. Colors include the classic black and tan, red, chocolate or dapple. Almost any combination is acceptable. 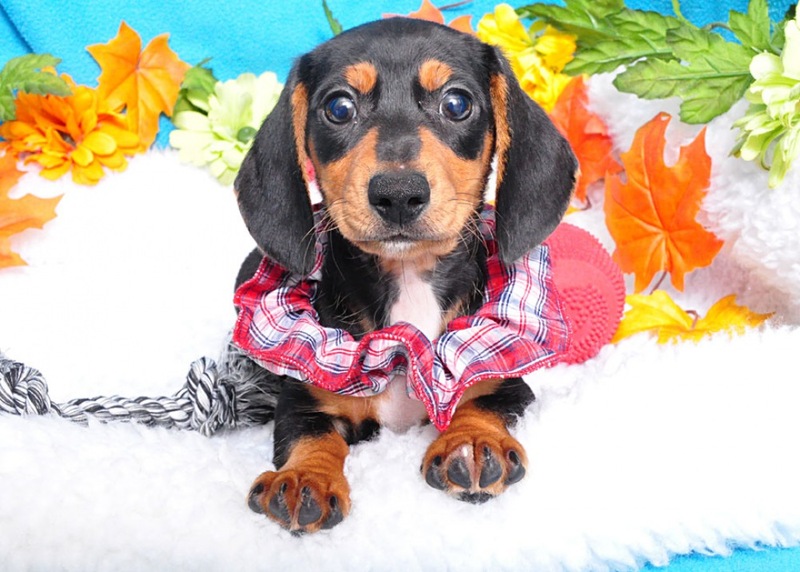 Dachshunds has a lively, upbeat personality - spunky, curious and friendly. He loves to play and clown around. Dachshunds got their start as badger hunters, and today they are fearless little dogs. They make an excellent watchdog for their small size. Due to their body length, Dachshunds should be discouraged from jumping from heights, especially furniture.